We continue a journey along the line of the Central Var metre-gauge railway. We travel from Saint-Jeannet to Vence! This next section of the follows the contours towards Grasse the centre of the perfumery industry in South East France. The route into Grasse itself will be for another post in this series. The Freycinet plan launched in 1879 by the minister of public works of the same name, Charles de Freycinet, provided for the construction of 8,700 km of lines of local interest. These lines were intended to promote economic development and open up communes which up until that date had been seriously isolated. The plane proposed more than a hundred projects including routes to Digne, Draguignan, Castellane, Cagnes, Barjols, Puget Théniers and Cuneo. From Nice to Digne by Puget-Théniers (150 km) – this line continues in use and has been thoroughly modernised (http://tourisme.trainprovence.com/accueil-english). From Nice to Meyrargues by Grasse and Draguignan (200 km) – the subject of this series of posts. The first of which can be found by following this link: https://wp.me/p45mBO-GX. From Toulon to Saint-Raphaël by the coast (103 km) – a further series of posts are due at the end of 2017. From Nice to Cuneo (standard-gauge line) – still existing (see for example, http://www.tendemerveilles.com/train-des-merveilles, https://www.ter.sncf.com/paca/loisirs/lignes-touristiques/train-des-merveilles). Another view of Saint-Jeannet Station. Immediately after leaving the Tunnel de les Champignonnieres the railway crosses the River Cagnes. This steep valley provided the necessary water powers for a series of mills and the road, at this point in the valley was named Chemins de Moulins – the Road of Mills. The mills were predominantly Olive Oil Mills. In the maps above, two show the line of the railway. The lower map is dated 1833. The railway, in both cases has been added to the map by hand. There are 8 mills shown and further details can be found on this link: http://sentiers.village.free.fr/Photos/Moulins/Moulins.htm. The viaduct was built by 1892 and is known as the Viaduct de Cagnes. It is curved and of 90 metres in length (12 traditional stone arched spans – 43° 44’ 45”N, 7° 07’ 58” E). The larger picture below gives an interesting insight into the use of the line as it shows dual gauge track. This allowed the line to take some standard gauge rolling stock. After the viaduct, the line quickly disappeared once again into tunnel – Le Tunnel des Canons. The tunnel was just 30 metres long (43 ° 44 ’35 “N, 7 ° 08′ 00” E) and opened out onto a short section of line travelling in an approximately southerly direction before another short tunnel was encountered – Le Tunnel des Fonts – 53 metres long (43° 44′ 09″ N, 7° 07′ 37″ E). The route between these tunnels is now a local road named Avenue de Provence. The first four pictures below look back along the line towards Saint-Jeannet. The fourth is the Tunnel des Fonts taken in the direction of travel and looking approximately South West. The final picture below is of the Tunnel des Fonts looking back along Avenue de Provence to the North West. before reaching another viaduct just under 1.5 kilometres from the tunnel. On the way it passed under the small accommodation bridge shown in the picture here. The next viaduct is Viaduct of Lubiane (43 ° 43 ’30 “N, 7 ° 06′ 28” E). It is a short viaduct of no more than 50 metres in length. The screenshot from Google Earth shows both the length of the N210 that was traversed and the viaduct. The viaduct is now on Avenue de Henri Matisse and carries traffic leaving Vence to head towards Saint-Jeannet. 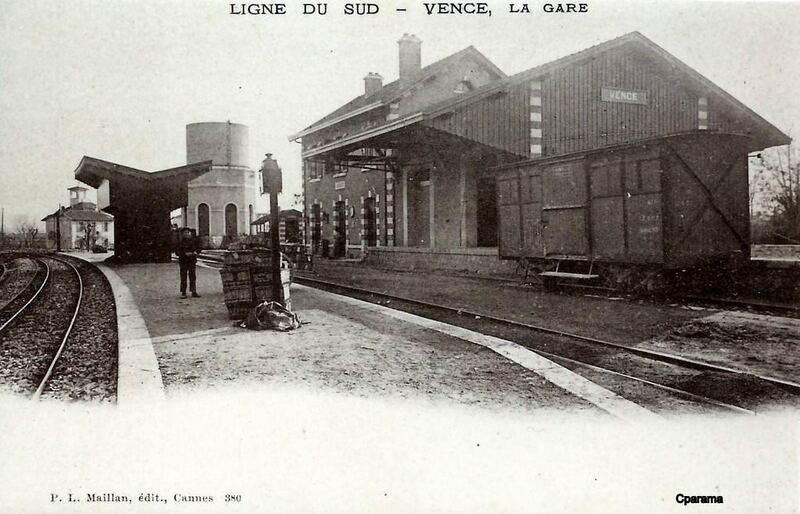 After crossing the valley of the Lubiane the railway travelled on the streets of Vence, first along the line of the N210 and then on into what is now the main square of the town. Another screenshot from Google Earth shows the square as it is now. The line in Vence travels East-West. What is now an open plaza was once Vence station. The following pictures give some insight into what the station was like when the railway was still active and show rails on the streets of the old town! And finally, for this post ……. the station in Vence was bracketed to the West by a girder bridge which still carries a road over the route of the line. As the line leaves Vence it now forms the Avenue Rhin et Danube. This entry was posted in Railways and Tramways Around Nice, Railways Blog on November 23, 2017 by rogerfarnworth.